Marine Lcpl. 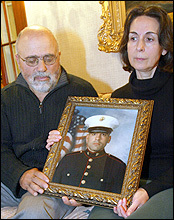 Dimitrios Gavriel - Run for the Fallen New Hampshire, Inc.
29, of New York City, NY; killed in action by enemy action in Anbar province, Iraq. 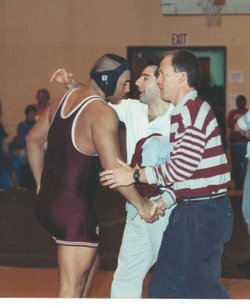 Dimitrios – Dimmy to his friends - was a heavyweight wrestling champion and honors student at Timberlane Regional High School in Plaistow, NH. One of Dimitrios’ former wrestling coaches said that the heavyweight’s decision to join the Marines was entirely in character. 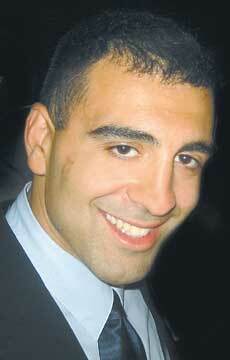 "He looked for a higher purpose," said Don Woodworth, the assistant principal at Timberlane Regional High School. "It all fits. He was a loyal kid." 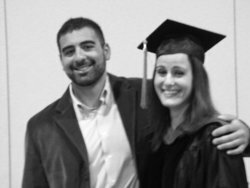 Upon graduation from Timberlane, Dimitrios attended Brown University, where he concentrated in neuroscience and organizational behavior -the closest area of study to a business major at the school. He also wrestled in the heavyweight division for Brown, developing a close circle of wrestling friends and fraternity brothers. 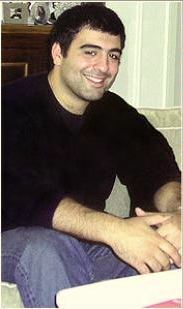 Dimitrios entered an analyst program at the investment bank PaineWebber after graduating in 1998, where he became an equity analyst in the real-estate department. From there he joined the research department at J.P. Morgan, and then went on to Credit Suisse First Boston and finally Banc of America. At the latter position, he put in 16-hour days crunching numbers and writing research reports until he was laid off in 2002. It was at this time, he decided to enlist in the Marines. His love of challenge, his patriotism and a desire to take action after the death of two friends on Sept. 11, 2001, prompted Dimitrios to walk away from a promising career on Wall. The day before he left to start training, he was offered another finance job. He was initially rejected by the Marine Corps because of his age (he was 27 at the time) and citing lingering knee injuries from his wrestling career, but he was not to be deterred. 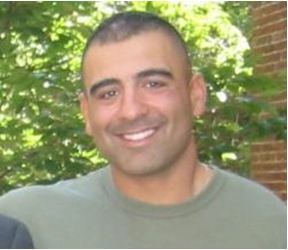 To prepare for the Marines, Dimitrios trained for a year, mostly near a friend’s house in New Jersey, where he loved to go fishing and running 10 miles a day and eventually losing more than 40 pounds. He lobbied for the Marines to accept him, and in October 2003 was finally accepted and off to boot camp. Family and friends, former colleagues paint a portrait of a man who chose his friends carefully, but chose them for the long term; who valued loyalty and the idea of brotherhood; who put his heart in whatever he did; who was an oddball jokester; who loved sports, fishing and living in New York City. In many ways he was like the other average young bankers working on Wall Street, and spending time in the local bars on the West Side on weekends. In New York, he lived in a small studio apartment which he called “a box.” His apartment was filled with antiques his parents bought for him at New England yard sales, an acoustic guitar he was teaching himself how to play and group shots from the weddings he had attended. “I’d never seen someone in so many wedding parties,” said Anthony Farinha, 29, a house mate from Brown. 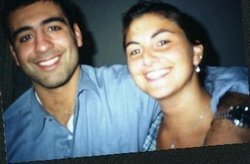 When his college friends came to town, he’d host them all at his place, and they’d hit the Upper West Side dive bar Yogi’s, his favorite haunt. They’d play Johnny Cash on the juke box, toss peanut shells on the floor. His drink of choice? Jim Beam. Dimitrios rode his blue BMW motorcycle to work, and occasionally wore his biker boots to the office. “He didn’t show up in a navy blue pinstriped suit and Hermès tie, because every other banker in the world did,” said Alexis Hughes, a former colleague from Wall Street. “He showed up at meetings with his motorcycle helmet. And I think that’s something to respect.” In some way, this small show of rebellion might have represents his uncertainty about his career, In his last months at Banc of America, he’d begun to call it a “jobby-job,” which his mother described as his version of a nine-to-five job. The Henry Blodget–era scandals on Wall Street discouraged him, making him question his career choice. Dimitrios found his higher purpose fighting with the Marines in Iraq against those he believed threatened everything he loved. When he was offered another finance job the day before he left for training (after a year of not working and focusing on being accepted to the Marines), by then his decision was firm. “My wife and I went to see him off to boot camp, in Haverhill, Mass., and he said that he felt it was fate playing with him, that he would have been miserable had he not gone [to boot camp],” said Matt McClelland, his best friend. For Dimitrois, it wasn’t a blind decision. “We all expressed our reservations and hesitations; he knew what the risks were,” said Anthony Farinha, his roommate from Brown. His parents were often unsure about what was happening with Dimitrios in Iraq. He would attempt to reassure them. “They have better use for me than having me run around with a gun,” he had told his mother. “His biggest worry was that his mother would find out and worry about him,” said Matt McClelland. But he was serving as a rifleman in Iraq. Just a few weeks prior to his death, he had been injured by shrapnel in his leg from a grenade explosion. About a week later however, they were short men for a mission, Dimitrious, still limping, went into battle in Falluja. He had told his parents only that he had hurt his ankle. It wasn’t until he called to tell them he was going to be awarded the Purple Heart, they that knew he had been wounded in action. ﻿His awards and decorations include National Defense Service Medal, Iraq Campaign Medal, Global War on Terrorism Expeditionary Medal, and two purple hearts by President George W. Bush. He was buried with full military honors at Arlington National Cemetery. The family has a scholarship in his memory at Timberlane Regional High School to benefit two scholastic wrestlers every year. Contributions can mailed to the school at 36 Greenough Road, Plaistow, NH, 03865. Dimitrios is survived by his parents Penelope and Chris Gavriel and his sister Christina.